The collective launch of the charities’ respective campaigns will be formally unveiled at a special event at the Tempo Cafe in the Bon Accord Centre in Aberdeen. Jackie Bremner, Project Director, NHS Grampian, said: “We’ve made a significant investment of £163.7 million which covers the construction and equipping of these exciting new facilities. These buildings will be more than just the bricks, mortar and new equipment though - it’s the people who will breathe the life into them and make them a focal point for our communities for years to come. “Whether it’s NHS staff, our patients, their families or the people who do such fantastic work on behalf of our fundraising partners, we are hugely grateful for the important role they play in helping us deliver the ‘extras’ which can’t be covered by the core NHS budget. “These campaigns will really deliver the difference and allow us to create truly special places for patients, visitors and staff that is unrivalled anywhere in the country. “The theme of these fundraising campaigns is ‘Delivering the Difference’ and I am certain this campaign – with the support of the people of the north of Scotland - will help us to deliver two truly world class health care facilities. The ANCHOR Centre, the first of its kind in Scotland, will provide modern, high quality accommodation for the delivery of co-ordinated Oncology and Haematology out-patient and day-patient services, benefitting patients by providing enhanced clinical spaces in the same facility. The centre will be co-located with the existing Radiotherapy Centre which opened in 2013 and will include an Aseptic Pharmacy Suite and dispensary reducing patient treatment times and need to travel into ARI for medicines when going home. The Baird Family Hospital, which is also the first of its kind in Scotland, will replace the existing ageing Aberdeen Maternity Hospital. Additionally, it will provide all breast and gynaecology services, currently located in ARI. It will also provide direct corridor links to both Aberdeen Royal Infirmary and Royal Aberdeen Children’s Hospital for women who require intensive care and neonates who need specialist paediatric surgery. Both facilities are scheduled to open during 2021. Dr James S Milne, Chairman, Friends of ANCHOR said: “We are delighted to launch our fundraising campaign for the ANCHOR Centre. 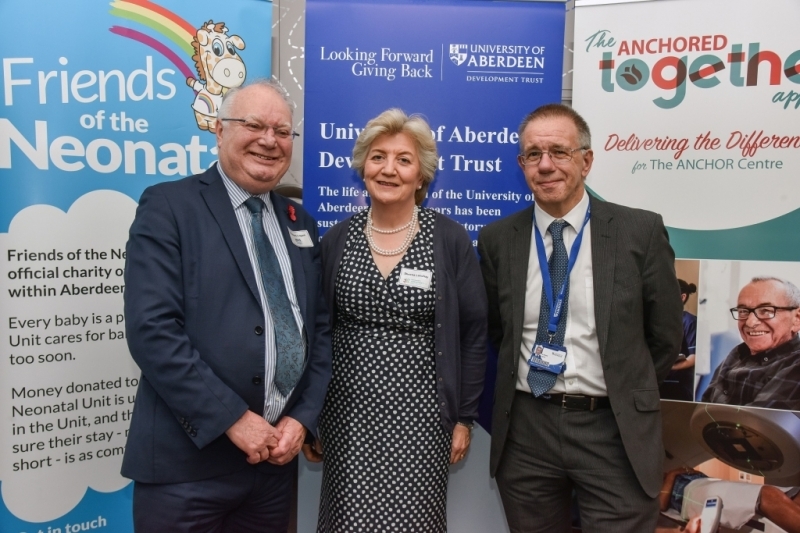 With the fundraising for ANCHOR, The Baird Family Hospital and research going live simultaneously it seemed right to collaborate for the launch and show mutual support and enthusiasm for our respective fundraising appeals; all of which will ultimately benefit the vast population within the North-east of Scotland. David Wood, Chief Executive of The ARCHIE Foundation, said: ‘We are delighted to be supporting the fundraising campaign for the Baird Family Hospital. The charities joining forces will really benefit people across Grampian and the North of Scotland. ‘The Baird Family Hospital project allows The ARCHIE Foundation to take an even wider approach to ‘making the difference’. We will play a crucial role in the development of this outstanding new hospital, while continuing to support the Royal Aberdeen Children’s Hospital.